Fully Loaded Potato Salad…it’s like music to my ears. Potato Salad in my opinion is perfect any way you make it, as long as it has mayonnaise, of course. None of this German-style potato salad over here. Show me da mayo! 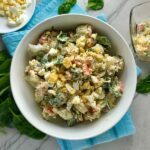 Ok, now that you know that I am a mayo-lover, we can move on to the BEST PART of this recipe…it has everything you could want in a potato salad! 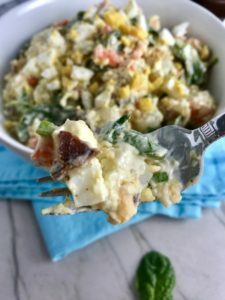 This Fully Loaded Potato Salad has salty bacon and cheddar cheese, creamy and rich egg, fresh scallions and baby spinach, and crunchy carrots. The dressing is simple with a blend of yellow mustard and mayo. YUMM-Y! 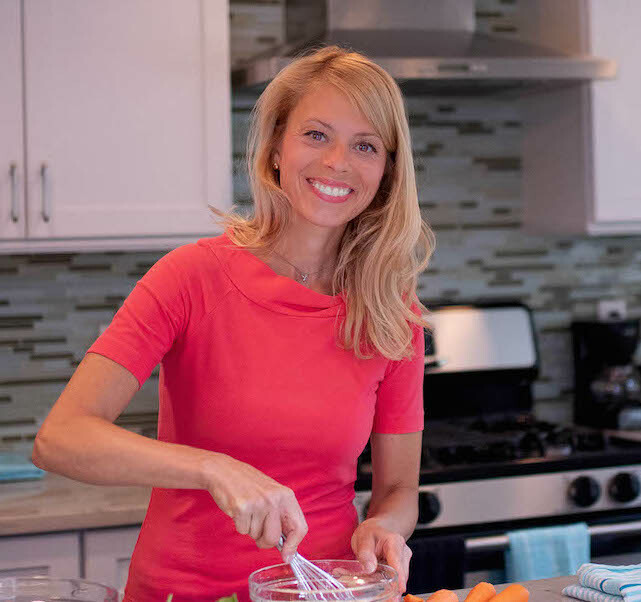 If you have been following my recipes and my blog, you know that I love to create EASY, YUMMY, COMFORT-FOOD with a HEALTHY TWIST. And what can be more comforting than Potato Salad with bacon, egg, and cheese? So the healthy twist here is obviously the addition of veggies. By adding carrots and spinach, you have made this healthy, right? **note, I am whistling badly and stepping away from the computer** Ok, so maybe healthy is a stretch, but the veggies are definitely good for you and therefore, I stand by healthy-ish. 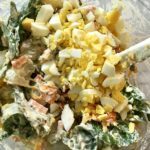 My love for potato salad starts with my Mom, as she would make it for parties and for holidays, the times tied to warm memories. One of my favorite memories on Thanksgiving and Christmas is having leftover Turkey or Ham with Mom’s homemade potato salad. She and I would literally have a plate of it for breakfast, then lunch, then dinner again…it was a tradition for us. Come to think of it, I bet this is where my love for leftover dinner for breakfast stems from! You are busy, so these are the steps you can do a day or two in advance to prepare food ahead! 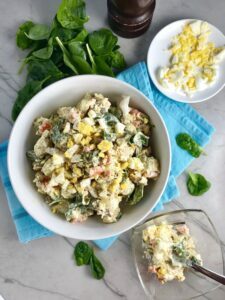 Actually, this ENTIRE Potato Salad can be made in advance and probably SHOULD be made 1-2 days ahead so the flavors really come together and seep into the potatoes. That said, there are some ingredients that you should make ahead to have time to cool before being added to the salad: the potatoes, eggs, and bacon. My Mom used to bake the potatoes and then peel them and cut. I just find it easier to peel them first, cut them to the right size, and then cook them in boiling water on the stove. Be sure to let them cool fully. Next, hard boil the eggs and then fully cool. Finally, prep the rest of the items: dice the carrots, finely slice the scallions, rough chop the spinach, make the dressing, and when the eggs are cooled, peel the and then dice into small pieces. Now comes the best part…mix it all together! 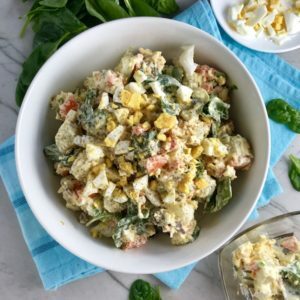 This Fully Loaded Potato Salad has salty bacon and cheddar cheese, creamy and rich egg, fresh scallions and baby spinach, and crunchy carrots. The dressing is simple with a blend of yellow mustard and mayo. Make ahead and enjoy later! YUMM-Y! You will need 1 small pot for eggs, 1 medium pot for potatoes, and 1 sheet pan or skillet for bacon (depending on how you want to cook it). Optional: metal cooling rack that fits into sheet pan. Make the potatoes by peeling them, then cutting into 3/4 inch pieces. Cover them with cold water + 1 tsp salt and then bring to a boil. Let them boil for about 5 minutes or until a fork slips in and out of the potato very easily. Then drain the potatoes and gently rinse with cold water or place into an ice water bowl to stop the cooking (you don't want them to turn to much). Hard boil the eggs by covering them with cold water and bringing them to a boil. As soon as the water starts to boil, turn off the heat, cover the pot and let sit for 7 minutes. Remove the eggs and run under cold water. Then put in the fridge to fully cool. The Bacon! Cook the bacon using whatever method you prefer so that it is crispy. I like the lazy mans version in the oven. Turn the oven to 400 degrees F and cover a pan with aluminum foil, then place a metal cooking rack on top of the aluminum. Place the bacon on the rack and then cook in the oven for 15 minutes or until the bacon is crispy, but not burned. Drain on a paper towel and then let cool to crumble. While the eggs, potatoes, and bacon are cooking, you can dice the carrots, finely slice the scallions, and rough chop the spinach, just so there aren't any really large leaves. When the eggs are cooled, peel the and then dice into small pieces. Set aside or store in the fridge. To make the dressing ahead, in a small mixing bowl add the mayonnaise and the mustard. Whisk together. set aside or store in fridge until ready to mix into the salad. To a large mixing bowl, add the potatoes, carrots, spinach, scallion, bacon, shredded cheddar, and the dressing. (NOTE: RESERVE 1/4 OF THE DRESSING FOR WHEN YOU ARE READY TO SERVE TO ADD SOME ADDITIONAL CREAMINESS.) Mix gently folding the dressing in to coat and combine all ingredients. Be careful not to break up or mush the potatoes. Once everything is combined, then add the egg and gently fold in again. You can leave some of the egg to garnish at the end if you like. That's it! 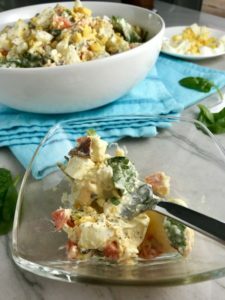 This salad is best when you let it sit for a few hours or over night so the potatoes soak up all of the wonderful flavors. 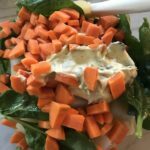 If the salad is a bit dry when you are ready to serve, simply add the reserved dressing and mix to add back some creaminess. Serve and enjoy!